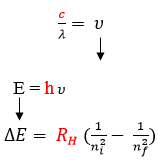 Maxwell, Plank, and Bohr’s equations are all interrelated. Constant values are highlighted in red. A variable from one equation can be plugged into another such that the three equations can all be used together to relate wavelength, frequency, energy, and shell number. Example: What is the wavelength of a electron transitioning from n= 3 to n= 1? Is this electron emitting or absorbing energy? Explain. 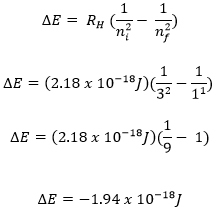 PART II: Combined Maxwell and Plank equations and solve for wavelength using energy value found in part I.